We have just over a week left in the month of October. And you know what that means. The holiday shopping season is almost here! Once the Halloween decorations come down, the Christmas decorations go up. And the number of customers looking for gifts goes through the roof! If you truly want to take advantage of all of those holiday shoppers and their need to find gifts for their loved ones, you’ll add gift cards to your list of purchasable items. 1. Retailers who switch from paper gift certificates to plastic gift cards typically see a 50-100% increase in sales. People love the convenience that comes with gift cards because they don’t force you to spend the entire value of the gift card in one shot. With paper gift certificates, they have no choice but to receive change or accept the fact that no change will be offered. Gift cards are great for your business because you never have to give change. The remaining funds on the cards are inevitably coming back to you! 2. The average gift card user ends up spending an extra 20% beyond the value of the card. Why are we worried about giving back change anyway? Chances are, the gift card recipients who come into your store will be spending more than the values of their cards. This means that every time you sell a gift card, you are almost guaranteeing yourself that you’ll be making a sale that will bring more money into your business. 3. More than $41 billion in gift cards went unused between 2005 and 2011. If there’s anything better than having people spend more than the value of their cards, it is people not using their cards at all. This may sound weird, but companies have greatly benefitted from the fact that many of the gift cards that they sell go unused. That means that they have earned money by selling nothing at all! You can do the same. 4. Gift cards are most popular with teenagers. One survey reports 98% of teens have either purchased or received a gift card. If you’re looking to grow your business, gift cards are your “in”. Evidently, they are very popular with members of the younger generation. With so many young people earning disposable income, you’ll greatly benefit from the sales of gift cards this upcoming holiday season. 5. Gift cards have been the most requested item on holiday wish lists since 2007. Here’s the deal. People want gift cards. Why? Because, all too often, people receive gifts they don’t like. The wrong size, the wrong colour, the wrong gift period! To avoid that, more and more people are asking for gift cards knowing that they will allow for the purchase of exactly what they want or what they need. 6. The most commonly purchased gift card amount is $25. What is the average transaction size at your place of business? Now add $25 to that. If people like your store, they’re bound to recommend it to others. $25 gift cards are considered both affordable and reasonable. This holiday season, be sure to stack your countertops with a gift card display. You’re bound to increase your sales well into the new year! In our experience, gift cards encourage repeat business, attract new customers and boost sales all year long. 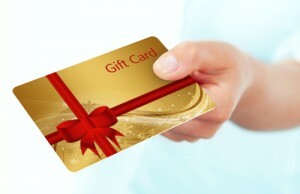 To order gift cards for your business, call Canadian POS Corporation at 1-877-748-2884 or email us at info@cdnpos.com.